It's important to do a seasonal inspection of your car's tire tread to determine if a replacement is needed. Even if you have all-season tires with plenty of tread remaining, there is still a slight risk of skidding and swerving during a rain storm. 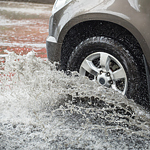 Slowing down is perhaps the best precaution that you could take to avoid loss of control on a road that's covered in water.